Chickpeas with Potatoes & Onions. All natural. Perfectly spiced. Vegetarian. Create Indian home style culinary delights like a pro! What's so special? Home style cooking, in small batches with fresh, natural ingredients using nutritional recipes that deliver authentic tastes and aromas. No preservatives, nothing artificial. Jyoti prepares a range of delicious Indian foods for today's life styles. Heat 'N Serve: Matar-Paneer (cheese and peas), Delhi saag (spinach/mustard greens), Punjabi chhole (spicy chickpeas), Jaipur Karhi (organic potato dumplings in spicy buttermilk), Madras Sambar (lentils and vegetables) and Dal Makhani (lentils and beans in a delicious sauce), which can be heated in the microwave, oven or stove top. Also, baby dark chickpeas (kala channa) - a versatile gourmet bean and a variety of delicious masala simmer sauces. 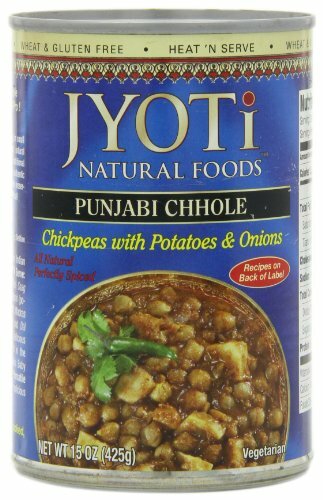 Jyoti Punjabi chhole is a combination of chickpeas, potatoes and onions in a spicy, tangy aromatic sauce. This entree is excellent with breads, rice or coucous, or as a side dish. Various dishes can be made with Punjabi Chhole. Heat 'n serve entree. Product of USA.